The attempt by a NATO fighter aircraft to approach a Russian plane carrying Defense Minister Sergei Shoigu on Wednesday became only the latest episode in a string of similar incidents along Russia's western borders. On June 21, a NATO F-16 fighter aircraft made an attempt to approach the plane carrying Russian Defense Minister Sergei Shoigu over neutral Baltic waters, but was promptly chased away by a Russian Su-27 warplane. On Monday, Russia scrambled its Su-27 fighter to intercept a target over neutral Baltic Sea waters, which turned out to be a US Boeing RC-135 reconnaissance aircraft. Ten minutes after the incident, another RC-135 entered the zone, which was also intercepted by the Russian Su-27. 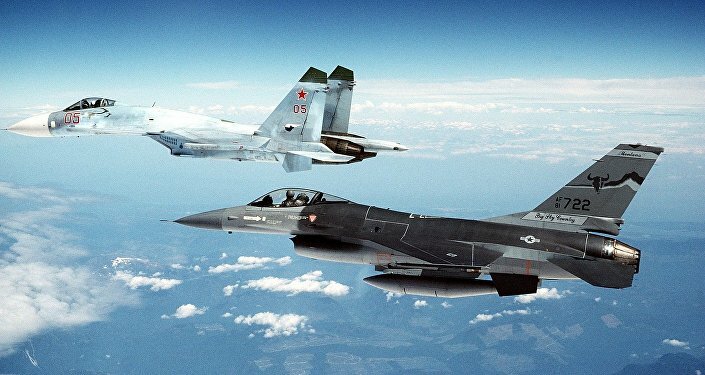 The Russian Defense Ministry said that over the past week, US and NATO reconnaissance aircraft have carried out more than 15 flights over the Baltics with reconnaissance purposes in the immediate vicinity of the Russian border. Russian military analysts commented to Sputnik on the incidents. Most of the flights of NATO reconnaissance aircraft were within the area of responsibility of Russia's 6th Air and Air Defense Forces Army. This strategic unit of the Russian Aerospace Forces is one of the strongest and best equipped. It covers the sky above 29 Russian regions in the west of the country and safeguards 3,750 kilometers of Russia's state border. In case of a hypothetic armed conflict with NATO member states, this particular unit will be the first to deter the air and missile strike of the enemy aviation. "It's only too natural that this direction, to put it mildly, is of a particular interest to NATO," Russian defense analyst, retired Colonel Alexander Zhilin, a military expert who heads the Center for the Study of Applied Problems of National Security told Sputnik. 'They are trying to reconnoiter at most the potential of our units in this particular district. American RC-135 reconnaissance aircraft are the most often to fly alongside Russia's borders. These are the aircraft of electronic reconnaissance, whose task is to identify and fixate the radio frequency used for negotiations by the military and other law enforcement units, for example, FSB Border Guard units," he explained. The expert particularly noted that this kind of information is gathered purely in case of a planned warfare. These frequencies are used, among others, to provide software for the radio-electronic warfare units which will enable them during the so-called "hot phase" of the warfare to jam and eavesdrop the enemy. The expert stressed that such reconnaissance is always done covertly. Numerous military drills of NATO member states in Eastern Europe, bellicose statements of its generals and shouting of the Baltic politicians about the so-called "Russian threat" is nothing but a cover for a silent combat work to reveal any possible loopholes in Russian defense, he said. One of the special tasks of the western intelligence is the detection of the location of Russia's air defense missile systems of the 6th Air and Air Defense Forces Army and of the Russia's Western military district as a whole. What Was a US Spy Plane Searching for Along Russia's Borders on V-Day? For the last decade, Russian military leadership was able to set up a serious multi-echelon air defense system in this district. In case of an aerial attack, S-300PM and S-400 air defense missile systems, which are able to hit targets at a distance up to 400 kilometers (depending on the intercepting missile) will be the first to join the battle. If the enemy is able to pass through the first line of defense, then middle-range complexes S-300 PS and S-350 Vityaz will join in. The aircraft and missiles which were still able to escape will then come under fire of the short-range system Pantsir-S1. In case of need, these systems could be reinforced by air defense missile systems of the Ground Forces, namely long-range S-300V, Buk-M2, Tor M2 and others. The enemy of course has no desire to face such a missile defense "fence", thus he tries to locate the positions of Russian systems to be able to destroy it beforehand. Political scientist and professor at the Academy of Military Sciences Sergei Sudakov explained to Sputnik how it works: the US and NATO are trying to spot the exact location of these systems by 'live-lure. " When a provocateur aircraft approaches the border, the radar systems switch on, catch the goal and start tracking it thus revealing their location. Meanwhile, the US satellites in the sky above the region make the aerial mapping of the area based on the data received from the aircraft. The aim is to locate the types of armament pegged to the radar, their number and exact location. Meanwhile, Alexander Zhilin said that Russian pilots are also of particular interest to NATO. They measure how quickly Russian jets take to the air, their speed, the eagerness to encounter, the frequencies they use and whether they are acting cautiously or courageously. The recent attempt by a NATO F-16 fighter aircraft to approach a Russian plane carrying Defense Minister Sergei Shoigu was a provocation of this kind. However it was on the verge of breaking the rules. An interception of a high-profile aircraft which carried a high-ranking official or high-profile diplomatic values is a slap which could incite a large-scale war. However the pilot of Russia's Su-27 jet was absolutely adequate who just chased away the provocateur from the aircraft of the Russian Defense Minister without any risk, the expert concluded.